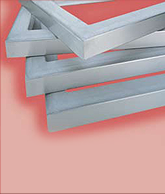 Eino Products is your “go-to” place for aluminum screen printing frames, whether you are looking for retensionable or rigid aluminum frames, we make it. All of our Diamond Chase screen printing frames are made to order so you can get exactly the size you need when you need it. Delivery times are short because we stock the raw materials on our floor, manufacturing all of our frames here in America with the highest quality materials under the strictest quality standards. 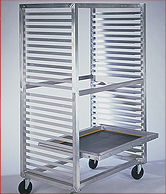 Along with the frames, we also manufacture custom carts, racks, and our manual adjustable Tension Quik stretchers. 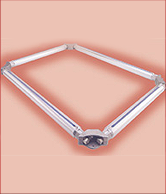 We carry replacement parts and will rework your screen printing frames. No order is too small or too large. Contact us on our toll free line at 800-245-5283 and ask for Shilo. During regular business hours you can call us and always reach a real person, someone who can and will help you with your questions and requirements. 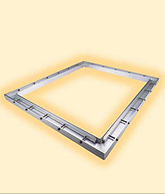 Retensionable frames have the ability to add tension to the mesh that is attached. Once mesh is attached it can be tightened at the will of the user. Retensionable frames have the ability to add tension to the mesh fabric after each printing cycle. The ability to tighten, use, and repeat has the benefit of stretching the mesh threads to a point that they stabilize or “work harden”, and will hold higher tension for extended printing. Higher tensions help the printer to reach the goal of having the surface of the screen be parallel to the substrate. Higher tensions achieved by using retensionable frames reduce ink consumption, reduce emulsion consumption, increase overall production speed, increase resolution, decrease exposure time, increase squeegee life, and dramatically increases screen-fabric life. With these frames, the “active lifetime” of the mesh is increased greatly over the stretch and glue screen. Retensionable frames have excellent multi-color registration control. They allow for an even distribution of tension across an entire surface. This results in less image distortion. They provide a better consistency from the beginning to the end of the print run. 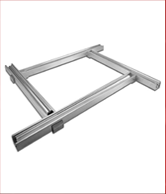 Using retensionable frames cost more initially but earn you more money in the long run. Using retensionable frames will lead your business to higher profits, quicker print speed, superior quality, faster growth, and fewer problems. A retensionable frame that is not abused should last the life of a company.